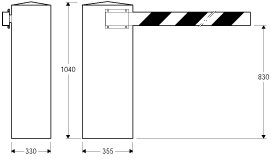 Electro-mechanical road barrier for heavy traffic. Twelve second opening for bars up to 6.0mtrs. Including Orion G BR control unit.